You can purchase the Biblical Greek Laminated Sheet online from ChristianBook.com or from your local bookseller. This series of laminated sheets enables students and pastors to see critical material at a glance and serves them well as they review for tests, for comprehensive exams, and for later on in life. Students of biblical Greek may not know everything they need to know, but they do know there’s a lot they need to know! Whether studying for exams or translating passages of Scripture, students need critical information at their fingertips. Instead, it’s usually scattered throughout textbooks, self-made crib sheets, and sticky-notes on their computer monitor. Now there’s a better way! The Zondervan Get an A! 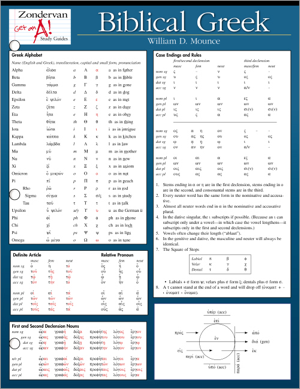 Study Guides to Biblical Greek are handy, at-a-glance study aids ideal for last minute review, a quick overview of grammar, or as an aid in translation or sermon preparation. Each set contains four information-packed sheets that are laminated and three-hole-punched, making them both durable and portable.